Welcome to the Smithsonian’s National Museum of the American Indian blog. We invite you to engage in lively discussion with us about our collections and public programs, and other subjects important to Native America and to you. The NMAI blog will offer a behind-the-scenes look at the museum—the work it takes to plan and produce exhibitions; the research and hands-on experience that make us a leader in conservation techniques; the Native artists, historians, and community leaders who help us determine the direction of the museum. Contributors will include all levels of museum staff including curators, conservators, researchers, and, on occasions like the launch of a new initiative, the director. Comments, we hope, will come from a wide range of people who share an interest in Native culture and contemporary life. We want to extend the visitor experience beyond our physical walls and provide a forum where you feel free to pose questions and post comments about Native history and contemporary culture. I am an Italian fondly interested in American Indians' heritage, culture, history and art. I am giving support with all my heart to any initiative aiming to promote my American Indian fellows' pride and consideration. I have a proposal which should help all of you reach such a goal worldwide. I already submitted it to some ones, but I never got replies of rap or approval, or that mine be a dream. May I have the opportunity to discuss it with you? If your reply will be positive, I will put it again under your frank evaluation and judgement. My name is Tim Miller and I'm a TV producer in NYC doing work for History Channel, Discovery and ABC. How might I get in touch with the "Ramp It Up" skaters featured in your blog article? I am happy to see the progress of the National Museum of the American Indian. As a College Associate Professor teaching courses in Native Studies here at New Mexico State University, I am acutely aware of the importance of NMAI in raising the consciousness of all people regarding Native history and culture. As a recipient of a community fellowship to study at the Smithsonian Museum of Natural History during the summer of 2000, I know the importance of learning how to do archival research. As a member of the Blackfeet Indian Nation, who worked on the reservation for 25 years, I also know how important the NMAI is to tribal people in many ways. I have had an interest in Native American Studies since a child growing up in a rural Hudson Valley community of NYS. Recently completed a BS in American Studies which included Native American Studies. that I may further my knowledge of Native American culture. Applause for the blog. This charter member wishes he lived nearer the NMAI to visit more often. Extending the "walls" is a terrific concept. My first visits, when I lived near New York City, were to the Heye, where I found some exhibits with massive emotional impact: the shirts--Crazy Horse's honor shirt and a ghost dance shirt--unforgettable! The roomful of unbelievably tacky, insulting pseudo-Indian kitsch--great pointed fun. On the Mall, however, no exhibit from any of several visits was similarly unforgettable. There were items of interest, but nothing that sticks in memory. In contrast, the sister museums around the Mall have had higher-impact exhibits: dinosaur skeletons, the Ft. McHenry "star-spangled banner," the Spirit of St. Louis. I would love to see NMAI develop some that make people gasp and say "OMG!" and want to return to see them again. I am Native American Ancestry. I am a member of the Museum. I am very please with the article on Walter Plecker. I think that shed lots of light on why many of the southeastern tribes nearly had their identity nearly wiped out. Excellent article. You are really making progress in education people on Native American Culture but not only focusing on people of the western cultures but southeast and northeast as well and our struggles with identity and presenting accurate historical depictions of who Native peoples are and what we have become after nearly 500 years of contact with Europeans and Africans and why our history has evolved somewhat differently. I have found in many instances that we are often compared to western cultures. Although we share a common origin historical our cultures were some what different and unique due to the impact of integration our people were forced to adhere to. Thanks for the opportunity to blog. My name is Corinne Remy and I am an employee of WMATA aka Metro in DC. I am coordinating the American Indian Diversity Tribute, for our organization, on November 18th, any interest in coming to speak with us. Our employees would love to hear about the museum as well as an overview on the "indivisibility" exhibition that's coming up. I hope you can join us; there is so much that our staff can learn to appreciate about Native Americans, especially the incorporation of the black slaves into the culture. If you cannot make it, I would be disappointed but woul accept any resources you offer me. Thanks for the great work you and your staff do at the museum! I am happy to see the progress of the National Museum of the American Indian. I am very please with the article on Walter Plecker. I think that shed lots of light on why many of the southeastern tribes nearly had their identity nearly wiped out. Excellent article. It's a good start that you introduced the Smithsonian’s National Museum of the American Indian blog. I have been searching for blogging sites that share interesting topics and discussions. Thanks and keep it up! I happy to view of National Museum of the American Indian andSmithsonian’s National Museum,the info in it is good.Thanks for posting. I enjoyed reading this post,its absolutely amazing. I'm happy to see the progress of the National Museum of the American Indian. I am very please with the article on Walter. I think that shed lots of light on why many of the southeastern tribes nearly had their identity almost wiped out. Excellent article. This is the first time i am into this blog.I am really happy to find this blog.I will take membership from this Museum. appreciate ur efforts to make progresses. native history and culture is a facinating subject 4 me. Is there a forum now 4 this community? Thanks for the blog. It was nice for me to read it. This is one of my favorite branches of the Smithsonian. We have had the opportunity to do some wonderful commemorative patches celebrating Native Americans. www.stadriemblems.com Thanks for all you do. Hi. Very interesting site. I found it on Google. I will definately recommend it to my friends. It was motivating. You seem very expert in your field. Awesome Blog, I am very interested in Native American studies and take any opportunity to learn. I also thank you for featuring something about American Indians who are actually our forefathers. They helped us paved the way to the way of life that we have today! It sure would be enjoyable to join your discussion! Thank you! Also, you might want to read these Thyromine reviews which I have put a lot of time on it! Thanks again! Absolutely fantastic museum and encourages a lot that we can easily found about the American India culture,history anything which you have interested about the museum so impressed and very nice! Again Thanks! Great article Kevin, thanks for this blog. Very inspiring. the history of Native Americans has always fascinated me. I would love to check out the museum. I am happy to see the progress of the National Museum and view of National Museum of the American Indian and Smithsonian’s National Museum,the info in it is good.Thanks for posting. I have had an interest in Native American Studies since a child growing up in a rural Hudson Valley community of NYS. Recently completed a BS in American Studies which included Native American Studies.I am pleased that my sister found the NMAI Blog so that I may further my knowledge of Native American culture. I guess this is sort of an old post, but i found some things on a mold removal job that look like they belong in a museum. I cleaned them up and was trying to do some research, it says your experts at preservation, do you discuss your techniques anywhere? I still find it odd that American Institutions still refer to the indigenous peoples of your land as "Indians." Up here in Canada we refer to our natives as First Nations or Aboriginals. Just my thoughts. I heard a story that the phrase 'indians' refers to Columbus looking for the Indians of the orient. I think it is real great to have a museum that highlights the culture of the native Indians from America! I am from South Africa and would love to see our Government establish a program that will honor the indigenous people of South Africa. Cheers for you and your team for the initiative. In this day and age, I believe it is essential to remember our past history. It teaches us where we come from and what our real purpose is. With all the technological advances we have today, it is easy to forget the intrinsic value of life. The American Indians and all the earlier natives of the world are much more connected to these values than we are. Good for you for including this part of Native American history! A blog will be an excellent way to include photos and facts about museums, artifacts, sculptures, and other pieces of artwork. Thanks for bringing a community together. It is important for all mankind to get a museum for this bright culture. I find this very interesting. Keep up the great work! I have a Native American descent and I appreciate the efforts of everyone on here. Thank You. I always admire Native Americans for their great value in their culture and history. Thanks, is the Museum open for public visit until today? I want to know if I can bring my friends there too for our history project. Krista—Both the museum on the National Mall in Washington and the Heye Center in New York are open every day except December 25 from 10 a.m. to 5:30 p.m. Please do visit and bring your friends. Native American Moccasins are really famous even currently. The popularity of Native American Moccasins is astounding. United states Indians are somewhat nomadic so they fashioned footwear that have flexible but sturdy soles and are long lasting enough to withstand the elements. Their merchandise have passed into mainstream America, and currently their shoes are worn by men and women of all walks of existence and all ages. Native Americans commonly reserve their moccasins for weddings, ceremonies and powwows when modern-day society utilizes them for casual don. My mother in law is a native Indian and as far as I am concern she should have the same rights as everybody! It is interesting to note that while this article was written in July 2009, it still attracts attention in March 2011. We all have them. Grasping hold of them can be the hard part. I think we all get glimmers of what it feels when they are most visible to us. Last week while working with Nimiipuu, or Nez Perce, material culture these dots felt present. I was born and raised on the reservation and part of my family goes back to that land for time immemorial, the other since the late 19th century. I grew up going to tribal Head Start and attending Lookinglass Days annually. I now study Transnational History and Native American Genocide at Clark University, specifically focusing on the resistance of the Nimmipuu nation against external forces. Even though I am an intern in the Education Department at NMAI, the power of working with this material culture connects me to many generations back, elucidating the importance of conservation for future generations. This connection to the past affords me a very still space to connect the dots in my life in the frenetic pace of Washington, D.C. When I researched my family tree a few years ago online, I made an astonishing discovery. One of my ancestors emigrated to the USA in the 19th Century and his daughter evidently married into a native American Indian family. I found a remarkable photograph in my late grandfathers belongings. Hello, I'm an Italian reader very interested in American Indians' culture, art and music. I appreciate a lot this site and definitely bookmarked it for reference. Thanks for your work! I am sitting in an aisle at the collections for the National Museum of the American Indian (NMAI) in Suitland, Maryland. 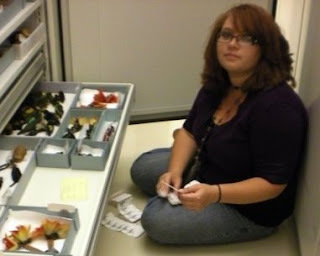 I am working at NMAI as a summer intern for 2009. The Barcode Project focused on fixing descriptions of objects and locating objects that have been identified for a different culture by switching out the barcodes for several communities. Scanning was then done for inventory. The task sounds tedious, it was. Thankfully I worked on this project with Sarah Stierch, NMAI intern (under Maria Galban, Curatorial Research Assistant). The teamwork was efficent and the talking helped time pass quickly. The week long project was completed in 2.5 days. However, it felt wonderful knowing that I was apart of fixing a problem of significance. Not only that but I was also honored to see so many amazing objects. Including headbands, feather fans, and shrunken sloth heads. In the picture I am switching out barcodes for Shuar objects.The people from the Shuar community will find their items properly labeled when they come in for research or for whatever may bring them in for a visit. The Shuar are indigenous to parts of South America, now Ecuador and Peru, within the Amazon and Andes region. We are considering undertaking barcoding our fine arts & sculpture inventory down here at St. Mary's College of Maryland. We have about 2,000 items that have never been barcoded and I'd welcome any tips about how to get started, recommendation on software programs and hardware scanners, and most importantly -- how best to affix the barcode labels to the objects. Do you ever have workshops on this topic? I think it would be a great idea to incorporate barcode labels in to more everyday life. Having seen that the iphone has app's that you can download to scan and compare prices of food online, as well as an app that tells you the content of the food. Great start, just hope they keep developing the idea! Barcodes are already used now. Only took 2 short years. This summer I am interning at the NMAI (National Museum of the American Indian) in D.C. I am working in the Repatriation department, however, my supervisor is the head archivist for NMAI, Jennifer O'Neal. The Native American Graves Protection and Repatriation Act (NAGPRA), a Federal law passed in 1990, provides a process for museums and Federal agencies to return certain Native American cultural items -- human remains, funerary objects, sacred objects, and objects of cultural patrimony - to lineal descendants, culturally affiliated Indian tribes, and Native Hawaiian organizations. My job is to organize internal records relating to Repatriation Cases at NMAI since 1990. I go through boxes of files and determine what records and documents are important for further research. I am assisting in the development and organization of the internal records of the museum’s Repatriation Office. I conduct detailed inventories of historical records, review files for duplicate records, and organize records to assist with the future structure of incoming records. My daily tasks also include: appraisal, arrangement, description, and preservation of a series of textual records within the Museum of the American Indian, Heye Foundation collection, and the National Congress of the American Indian (NCAI) collection. Today was my first full day on the job going through boxes of records. It's interesting going through the cases and reviewing all the research documents. I have a lot of work ahead of me, but I am getting some great on-the-job archives experience. Great work Naomi, we look forward to hearing from you in your endevours. Hey Kevin great post. My wife is 1/4 Mohawk Indian and her Grandfather was full blood Mohawk and lived on the Tyendanaga Reservation in Canada. I love to learn more about the Indian culture. The museum would be really cool to visit some time. Thanks again for your post. Thanks Naomi. Lots of Cherokee in my family line.